I love bookshelves and dream of built in beauties someday. 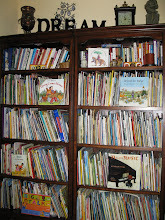 Found a fun video, "Organizing Bookshelves" by by Sean Ohlenkamp and Lisa Blonder Ohlenkamp. The credits made me laugh! Just found this blog, Classroom Bookshelf, that I feel is a wonderful site for teachers who want to use literature for "more than just reading." This is the description from this blog site: Every Monday we "post an entry on a recently published book for children or young adults. Each entry includes three sections: Book Review, Teaching Invitations, and Further Explorations. Our goal is to identify books that can be used in K-8 classrooms in a variety of ways." Since spending time with classroom teachers within the last 6 months in our Teacher Picture Book Club, we have been finding that teachers are continually looking for quality books that relate to their content area teaching. They are looking to expand their lists of appropriate and helpful books related to themes that fit into their curricula. This site is a good place to find these lists and recommendations for quality literature. I highly recommend it. I have just learned about this book, Yummy: the Last Days of a Southside Shorty by Greg Neri. Here is the book trailer. I'm thinking about using this book with my cohort group that is comprised of all urban teachers, as the focus seems to fit with some of the issues we've discussed and lamented about. I've shared this idea with the group and we'll see what they think. It has gotten high reviews. I'm curious as to how the teachers will view this book. It's on the top of my list to read. Spent some time today perusing children's literature blogs. So hard to find the time lately, but reading them gives me a shot in the arm and excites me so! Found again the Blue Rose Girls blog (bluerosegirls.blogspot.com), written by "Children's literature professionals who talk about books" including Grace Lin and Alvina Ling and others. I first learned of this blog when I was diligently following Grace Lin's blog (A Solitary Grace) and found a link to the Blue Rose Girls. I love Grace's books and her blog was so personal too. I began reading it when her husband Robert was living out his last days of cancer and she had various artists create Snowflakes for fundraising. I would have loved to buy one, but they were way beyond my budget, unfortunately. I haven't followed her blog lately, but used to love reading about her work as a children's author and illustrator and loved reading her blog entries to trips to China. Her current blog is Grace Notes. Glad I was reunited again with Grace Lin (and other Blue Rose Girls) at their blog today. Beginning Teacher Picture Book Club! Today Kathy Henn-Reinke and I begin research by implementing a Teacher Book Club focusing on picture books. It will be a short term club (October to March) where a small group of interested teachers spend a few hours each month talking about children's picture books. We plan to learn more about teachers' ideas about picture books and determine ways of implementing teacher book clubs related to children's literature as a form of professional development. 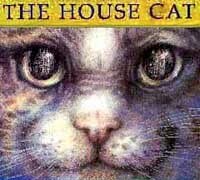 Tonight I plan to provide some background on the visual elements of picture books and design, using my favorite visual book, The House Cat, by Helen Cooper. See this year's winners at the 2010 awards page. I will be checking out these books and past winners to catch up on this important, empowering genre of literature for children. Today is National Keep a Poem in Your Pocket Day, a part of National Poetry month. It was started in 2002 in New York City and has gone national. To celebrate, I am sharing a favorite poem by a favorite children's author, Jean Little, from her book, Hey World, Here I Am! published in 1986. 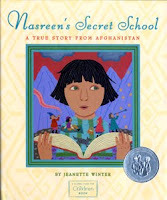 I have loved this book for years and have often used the poems from this little gem with my elementary-aged students and preservice teachers in the past as a means for encouraging personal reading response. ReadWriteThink is a website created by the National Council of Teachers of English (NCTE) and the International Reading Association (IRA) that contains lesson plans developed by teachers to help other teachers, as well as many other professional resources related to literacy. They have a link for celebrating National Keep A Poem In Your Pocket Day with students that includes lessons related to this event and poetry in general for teaching children in grades 1-12. Poets.org also has a link on it's website to help celebrate this poetic day. I have named this blog, Children's Literature Is For More than Just Reading and was the original title of the book that a colleague and I are writing. Its premise is that children's and young adult literature should not be used primarily to teach reading, but for much more than that-- enjoyment, appreciation and a focus on the aesthetics of books for young people should be the major purpose for reading children's books. I am a lover of children's and young adult books, and especially enjoy soaking up the visual qualities of picture books. I am a professor at National-Louis University working with teachers at the Master's level, a writer and a mixed media artist.